A Burgess Hill man has been sentenced to three years imprisonment for violent assaults on an ex-partner. 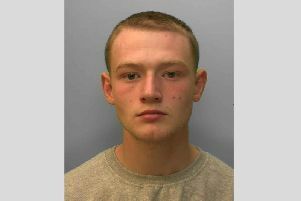 Sussex Police said in a statement that Anthony Benwell, 38, unemployed, of Valebridge Drive, Burgess Hill, was sentenced when he appeared at Hove Crown Court last Thursday (October 26), having pleaded guilty at a previous hearing to causing grievous bodily harm and actual bodily harm to a woman in her 30s with whom he had been in a volatile and intermittent relationship. He was given two and a half years for the GBH and six months for the ABH, to run consecutively, making three years in total. At a previous hearing Benwell was also given an indefinite Court Restraining Order prohibiting him from any further contact with the woman. Police said officers were called to the World’s End area of Burgess Hill at 8.40pm on Friday, April 21, after reports that a man had been attacking a woman. They found the woman in the street, in a very distressed state with cuts and bruises. They then went to Benwell’s nearby address to arrest him. He refused to come out of the property and threatened officers but they patiently kept talking to him and after four hours he agreed to come out and was arrested without further incident, police said. Detective Inspector Sue Neilson of the West Sussex Safeguarding Investigations Unit said: “We are very grateful for the actions of members of the public who came to her aid that night having witnessed the assault. “They called the police and provided witness statements. The independent evidence they provided was invaluable to our case and in the protection of the vulnerable victim. People can report domestic abuse by calling 101, online, or in person at your local police station. When people report domestic abuse police will take immediate steps to ensure the safety of the victim. This may include removing the perpetrator, arranging medical assistance and gathering evidence. If you are a victim of domestic abuse, your case will be dealt with by officers specially trained in responding to domestic abuse. For information on counselling and support visit www.sussex.police.uk.